We offer a large variety of reporting options which is always expanding. Our reports are designed with accuracy and simplicity in mind. Custom reports are can be created should the standard options not fit a customer's needs and are quoted on a POA basis. Our dashboard interface is something we regularly receive customer praise for. 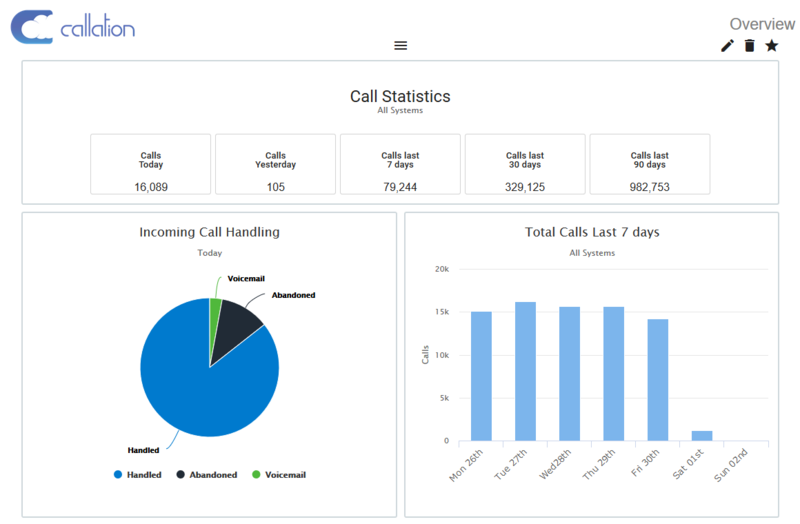 There are a variety of available layouts and 'widgets' that can be configured to help businesses maintain up to date visibility of their business productivity and customer calling habits. Rather than try and list all of our available reports and options, we recommend customers take a look at our live demo environment to see some of the options available on offer (link at the top of the page). 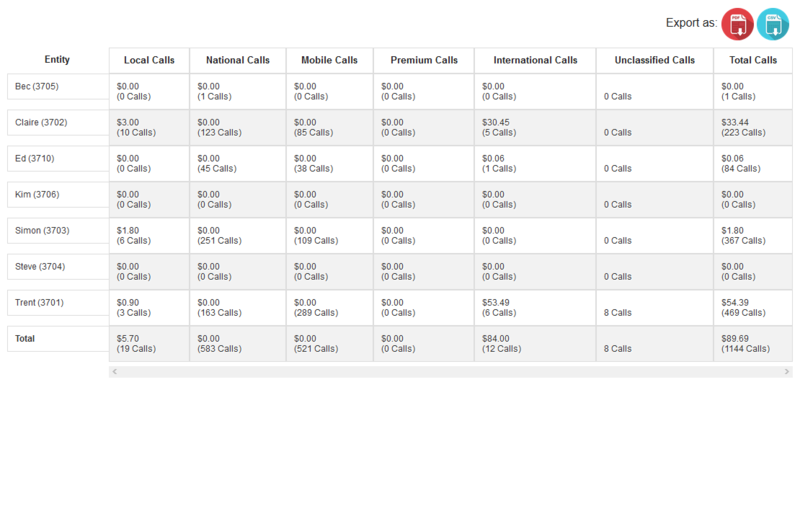 In addition to reporting, we also offer call accounting as an automatic inclusion with the platform. 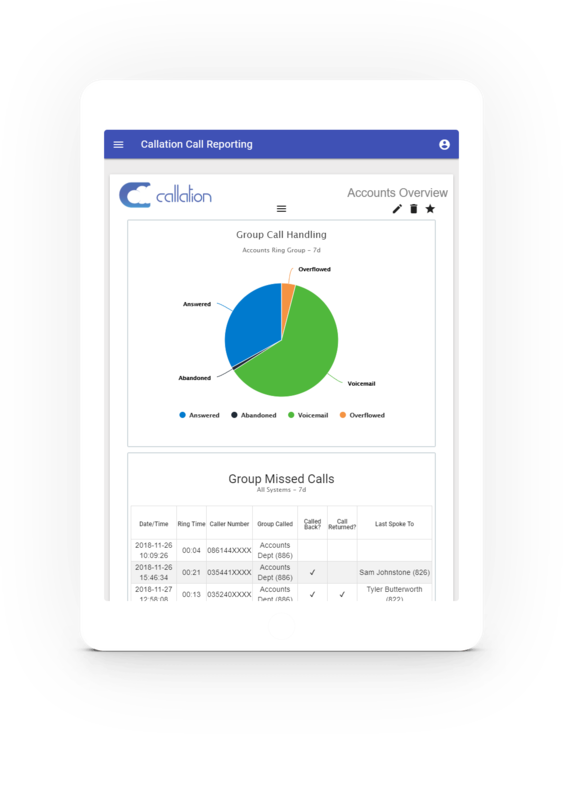 Our call accounting reports enable you to report on extensions, groups or entire system call expenses as either an overall total, or an itemized account summary similar to what you would receive on a mobile bill. 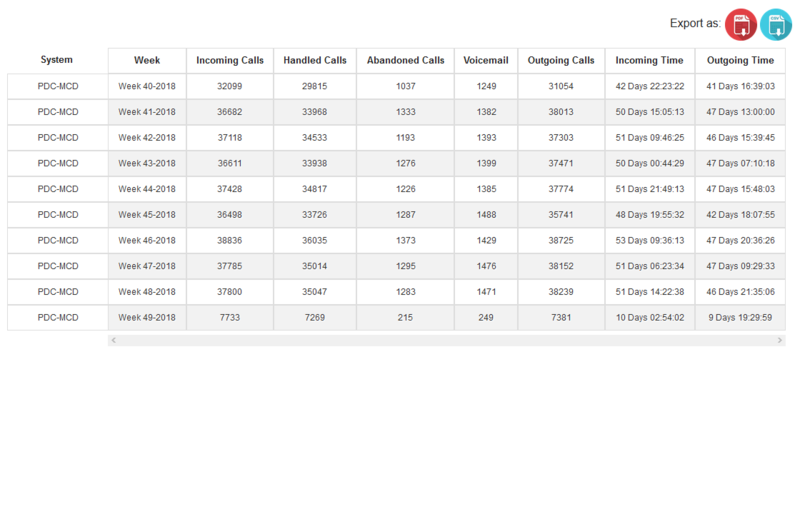 Call accounting options are also available on our dashboards to enable businesses to track their call expenses by extension in real time and avoid end of month bill shock in the event long and/or expensive overseas calls are being made by enabling them to be identified immediately. Our hosted platform gives you access to your reports from anywhere. It also means you have immediate access to the lastest updates. The service operates by means of a small piece of software that is installed on an existing server or PC that can access both the internet and the system(s) to be reported. This software can exist on premise, in another data centre or wherever your phone system is located. One installation can connect to as many accessible systems as it is configured to connect to. If you don't have a suitable system to install the software onto, we can provide a small inexpensive appliance for this purpose. The collection software acts as a relay point between your system(s) and the hosted platform and will upload stored data to the platform as a configured interval (usually every couple of minutes). It will also hold up to 30 days worth of call information locally in the event you lose internet access for a period of time and is self updating. All data sent to and from our servers is encrypted from end to end with 256-bit SSL encryption. Our servers are regularly patched and updated to keep ahead of any potential operating system vulerabilities. The only people with access your data are You/Your Team/Authorized Accounts, Your Reseller and the Callation Development Team. Rest assures none of your information will ever intentionally be provided to a third party without your express consent. Our service is a fraction of the cost of both on-premise and hosted alternatives. 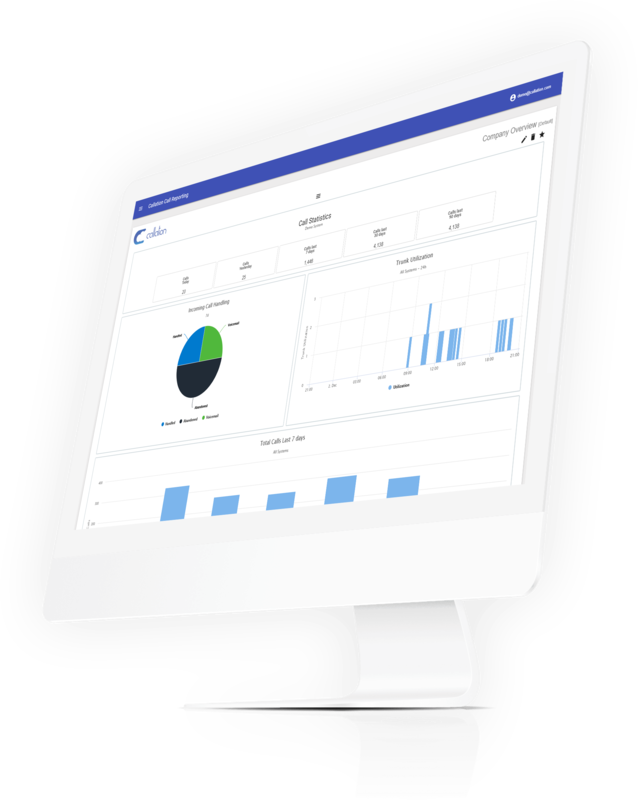 A hosted reporting service means you don't need to provide any expensive server hardware or spend money on ongoing hardware and operating system upkeep. You also benefit from new reports and platform updates immediately without needing to pay for upgrades. Pricing is tiered based on the number of extensions on a system, and we provide generous discounts on RRP for our resale partners. Customized reports are available and are priced on a POA basis. Contact us today to discuss your requirements or to be put in touch with one of our local resellers. One of our newest offerings available to resellers is our whitelabel billing platform. We assist resellers that wholesale telephony based services in generating invoices for their own customers. We take the output data provided by your telephony wholesaler in CSV/TXT/JSON/API based output and run the information through our call accounting engine saving you time calculating costs and invoicing. We then generate individual end customer invoices that you can edit as required and/or download as a PDF to be sent straight to the customer with details of their call and service charges. Each end customer invoice can have their own service and call rates applied to allow for tailored and/or varied customer plans. This is a completely separate product to the standard Callation platform and is only available to partners. Please contact us for more information about this product or a demo. We are an online business so don't have a physical office to list. Our company is however 100% Australian owned and operated. Thanks! Your message has been sent!.